Rice bioscientist Aryeh Warmflash and alumnus Idse Heemskerk led a team that discovered stem cells are sensitive not only to the signals that form the "instructions" to create the pattern of the organism, but to how rapidly those signals are delivered. The lab set out to see if the amount of the signaling molecule was the primary cue for instructing the cells what to become. The answer was clearly "no" for one of the highly related pathways they studied – and, surprisingly, "yes" for the other. The open-access paper in eLife details the activities of two signaling pathways, Nodal and BMP4, in experimental models of early mammalian embryos. Both pathways are integral to the process known as gastrulation, when the body plan of the embryo is created. BMP4 triggers the process and defines the "ventral" or belly side of the embryo, where skin will form. On the opposite side, where BMP is low, the nervous system develops. When cells are exposed to BMP, it sustains change for as long as its triggering ligand is present. In contrast, the Nodal pathway, which causes cells to become muscle, the heart and other organs, is controlled by how its target cells sense and adapt to changes in the environment, especially to changing levels of its ligand. The researchers concluded interactions between these ligands, called morphogens, and cells are far more dynamic than previously thought, and not merely dependent on ligand concentration. 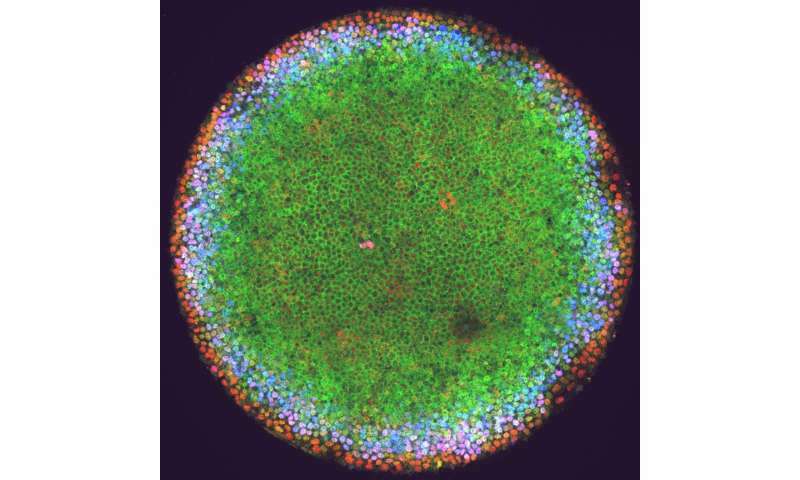 The Rice lab employs a unique experimental system mimicking growth in confined spaces that allows human embryonic stem cells to divide and differentiate, but in a controlled shape similar to that of the embryo. It lets researchers perturb a colony with proteins that trigger specific pathways to see how they interact with differentiating cells and with each other. Recently, the lab determined the WNT signaling pathway that carries signals across a cell membrane depends upon context for its actions. Nodal and BMP4 are part of the TGFb superfamily of proteins. The researchers found they alter how cells respond to WNT. "What's true for WNT is even more so for the TGFb pathways we looked at this time," said Warmflash, an assistant professor of biosciences. "For WNT, we highlighted how the same pathway can be deployed in different ways depending on context. This paper highlights how different pathways that function in parallel, almost in the same context, get used differently." Nodal and BMP4 are triggered by their matching ligands during gastrulation. In the process, both access a protein known as Smad4, which moves into the cell's nucleus when activated and can be tagged with green fluorescent protein (GFP). That allowed them to monitor the pathways' activities. "These pluripotent cells decide between different germ layers – the ectoderm, which goes on to become the nervous system and skin; the mesoderm, which forms bone, blood and muscle, and the endoderm, which forms the digestive tract and other organs," Warmflash said. "Over three days, cells make these decisions at the same time they're undergoing morphogenesis, which puts all those layers in the right place." Researchers once thought high signal in one area of the embryo and low signal in another determined differentiation, but the Rice lab's experiments showed otherwise. "We don't think cells are sensing high versus low," Warmflash said. "They're sensing whether the pathways, triggered by the presence of ligands, are turning on fast versus turning on slow." The Nodal pathway was most interesting. "Essentially, it's always transient," Warmflash said. "In the naïve picture, you might think of this pathway as a switch. But why does the signal turn off when the switch is on? Well, that's what it does. "It's important because it means the cells sense when the levels in the pathway change. They don't sense, 'It's here, I turn on.' They sense, 'OK, it's changing, so I turn on.' That gives them sensitivity to the dynamics." In experiments, the cells produced their own Nodal ligand as part of recreating the early embryo-like patterns. The researchers saw a wave of Nodal signaling sweep through the colonies at a rate of about one cell width per hour, Warmflash said. "Right after a wave comes through is when we see the differentiation markers that determine cell fates," he said. The researchers gained a measure of control over differentiation by pulsing the colony's exposure to the ligand for one hour and removing it for six hours over three cycles. "We showed those three hours of exposure, timed properly, drives differentiation of the cells better than 20 hours of exposure," Warmflash said. "We think that by understanding the dynamics, we will have a way to drive cells to particular fates and also to understand how those pathways work as cells make patterns during development."